Waldensian emblem, 1895. Via Wikicommons. 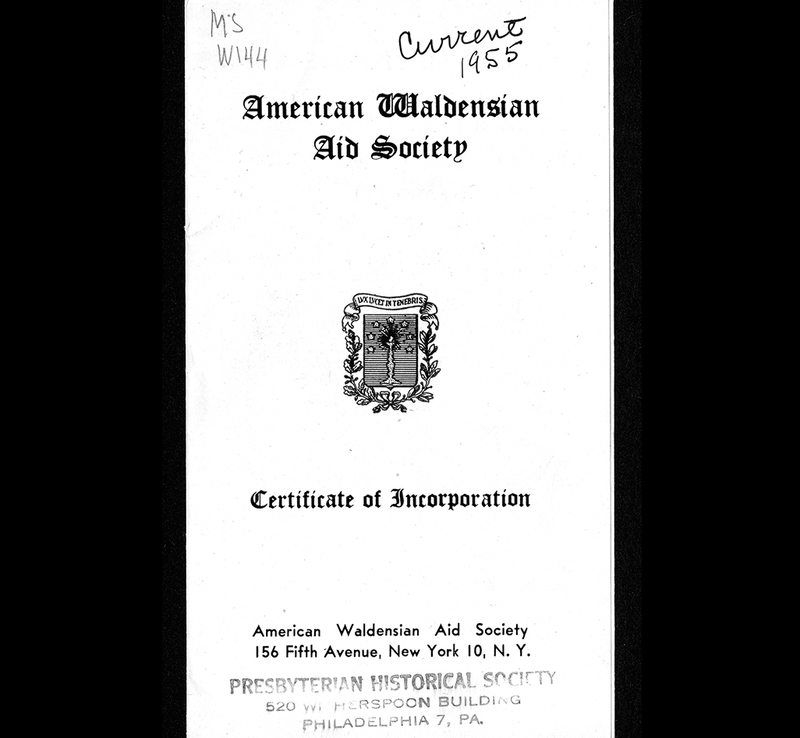 This year, the American Waldensian Society (AWS) celebrates its 110th anniversary. Founded in 1906 in New York City as the American Waldensian Aid Society, the society was created to assist Waldensians, not only in the New World but in impoverished parts of rural Italy. The Presbyterian Historical Society serves as the official repository for the American Waldensian Society. 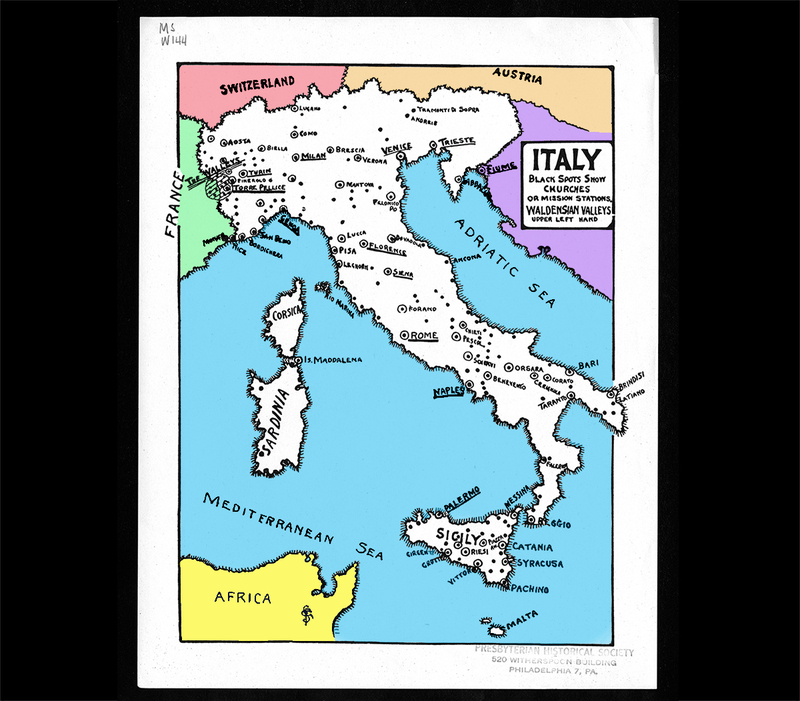 World War II-era map colorized by PHS. MS WI44. Click here for full image. The Waldensians’ founder was a twelfth-century merchant named Peter Valdo, or Valdesius, of Lyons; some historical sources refer to him as Peter Waldo. (The exact origin of the Waldensian name remains a mystery; some claim it comes from “Waldo,” others from “Vallis Dense”—the Alpine valleys Waldensians later settled in). Waldo was a rich merchant who spent his wealth translating the Bible into the local vernacular, an expensive endeavor in his day. Choosing a life of poverty, Waldo and his followers preached the gospel, bypassing the established church order. They believed that the Bible was the only connection between man and God and expressed disbelief in established Catholic practices such as purgatory, the intercession of the saints, and indulgences. Perhaps most shocking for that era, the Waldensians allowed women to preach. In 1179, Waldo and a coterie of followers travelled to Rome to meet with Pope Alexander III. When the Waldensians refused to stop challenging Catholic authority, they were excommunicated. Image close-up, 1955. MS WI44. From that point forward the Waldensians were widely persecuted, and some were burnt at the stake. Most dispersed and settled in remote areas of today’s Germany, southern Italy, and the Alps. In the “Waldensian Valleys” of the Italian Alps, they formed isolated, self-sufficient farming communities. Waldensian children were commonly taught to memorize one book of the Bible in case they had to flee without their possessions, so that their faith could never be misplaced. Waldensians originally followed the Episcopal order of church polity. During the Reformation they adopted the Presbyterian system, owing largely to the influence of William Farel, the same man who persuaded John Calvin to settle in Geneva. 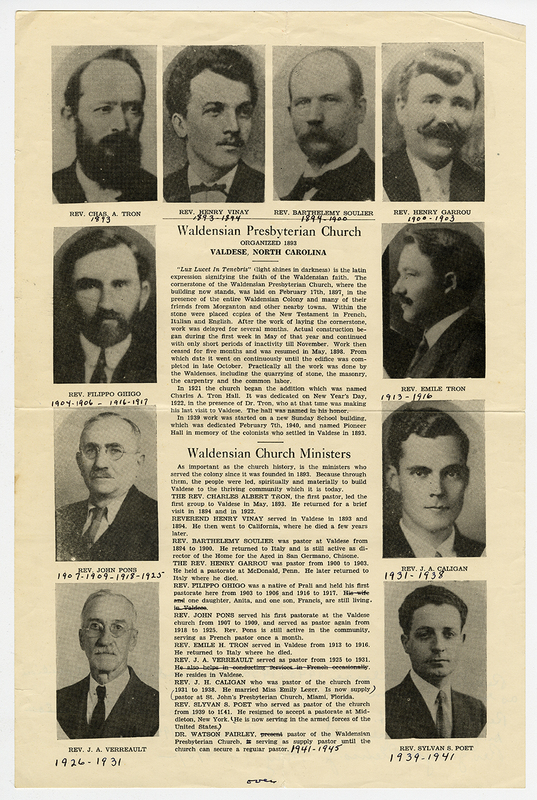 Waldensian churches in the United States would later join the Presbyterian Church in the U.S.A.
Poster of ministers of the Waldensian Presbyterian Church in Valdese, N.C. RG 425, Series I. Click here for full image. The Italian government gave the Waldensians full citizenship in 1848. By the early twentieth century, most of Italy’s 25,000 Waldensians were living as poor farmers in isolated valleys. Many immigrated to America, the first coming via Uruguay, where a civil war prevented a longer lasting settlement. The first Waldensian congregation in the United States was established in Monett, Missouri, in 1876. 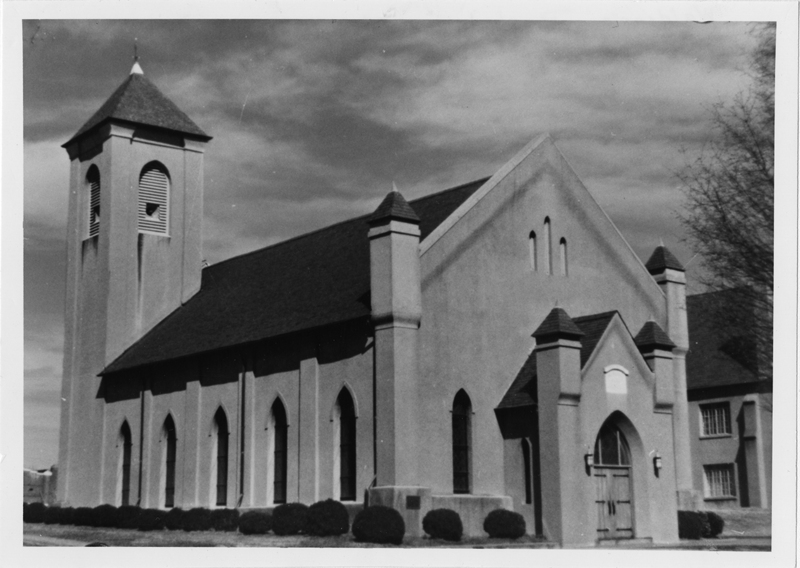 A prominent church developed in Burke County, North Carolina, where a local businessman offered a group of Waldensians land. Twenty-nine Waldensians sailed into New York Harbor and traveled to Western North Carolina by train. The congregation was organized and the town of Valdese founded in 1893. English language services did not begin until 1922. Prior to that, the church offered services in Waldensian Patois, a dialect of Provencal. 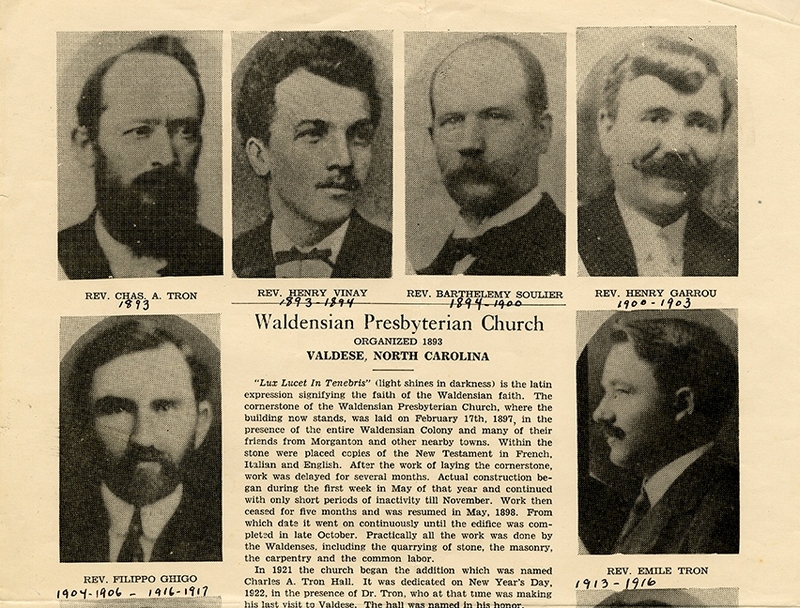 Waldensian Presbyterian Church, Valdese, N.C. RG 425, Series I.
Waldensians founded additional churches in Chicago and New York City. Collectively, the Waldensian communities grew prosperous enough to provide aid to their European counterparts. The AWS supported Waldensian churches, missionary work, clergy, orphanages, and the Waldensian Theological Society in Rome, one of the few Protestant seminaries in Italy. By 1954, there were ninety-three Waldensian congregations in Italy with a total of 26,000 members. As Waldensian churches in Italy became more self-supporting, the focus of the Aid Society shifted towards Protestant churches. In 1975, the Waldensian Church joined the Italian Methodist Church to form the Union of Methodist and Waldensian Churches. The Presbyterian Historical Society is a name that belies our wider affiliations. The society serves as the official archives for the Presbyterian Church (U.S.A.), but also for organizations such as the National Council of Churches, the American Sunday School Union, and the Religious News Service. We hold thirty-three processed boxes in our American Waldensian Society collection ready for researchers looking to explore the intriguing history of an influential faith community.